The International Community on Monday will support Libya's people to find a political transition away from current leader Muammar Gaddafi, President Barack Obama said as he outlined a support role the U.S. will play while an international coalition carries out attacks on Libyan defenses to enforce a no-fly zone. Because while our military mission is narrowly focused on saving lives, we continue to pursue the broader goal of a Libya that belongs not to a dictator but its people, he said. Secretary of State Hillary Clinton is in London on Monday, participating in a one-day conference with 40 representatives from various international organizations and countries seeking to support Libyans' efforts to make a political transition. Obama said he would commit the U.S. military in Libya to a non-combat role and provide humanitarian aid, as the U.S. pulls back from as NATO takes charge of protecting civilians from the Gaddafi regime. Efforts to establish a no fly zone and protect civilians with ship and submarine-based missiles, as well as coalition missiles mounted on warplanes, have enabled opposition forces to push Gaddafi's forces away from eastern cities. Obama said Monday that starting that U.S. military support in continuing efforts will include help for intelligence, logistical support, search and rescue assistance and capabilities to jam Gaddafi regime communications, he said. 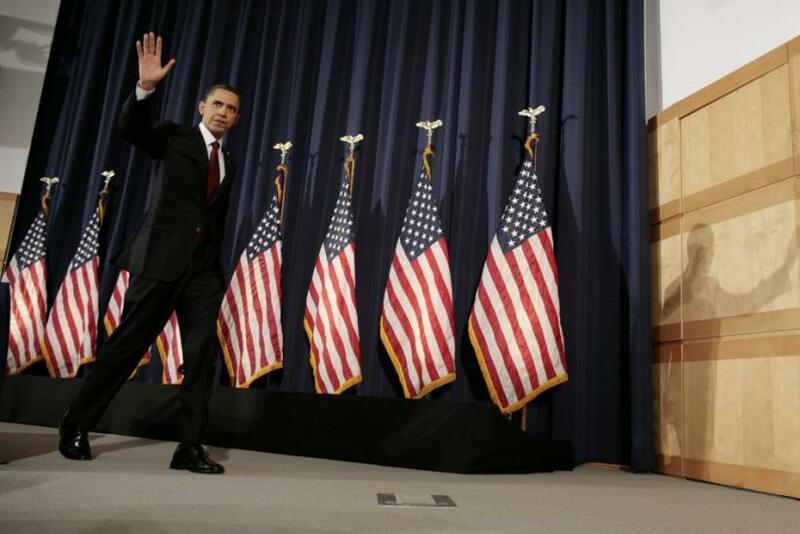 I am fully confident that our coalition will keep pressure on Gaddafi's remaining forces, Obama said. Obama said the United States had done what it said it would be doing. Going forward he said NATO would work with the international community to assist Libya's people and safeguard $33 billion in frozen funds from the Libyan government. The U.S. military support for the mission has been major until now. Of 199 Tomahawk missiles launched into Libya only seven came from coalition partners while the rest came from the U.S., Vice Adm. Bill Gortney said on Monday ahead of Obama's speech. Of 600 precision-guided munitions, which include missiles, 455 had come from the U.S. and 147 had come from the coalition, he told reporters.